The Nabtesco Group does business with about 1,000 suppliers of various scales, centering around the purchase of metal parts, and electronic and electrical components, outsourced machining, assembly and processing. Our business with suppliers is an important factor that affects the Nabtesco Group’s cost structure and QCD performance. It is indispensable to secure the supply chain continuously in order to achieve medium- to long-term growth. Therefore, we develop collaboration systems through fair, proper and transparent business transactions based on the proper cost structure, and close partnerships with suppliers. Also, we are well aware of the importance of meeting the demands and expectations of society regarding social and environmental impacts of activities in our supply chain. By developing mutual trust relationships with suppliers through fair, proper, and transparent transactions, we are committed to meeting our social responsibilities not just through the efforts of the Nabtesco Group alone but with the cooperation of the entire supply chain. 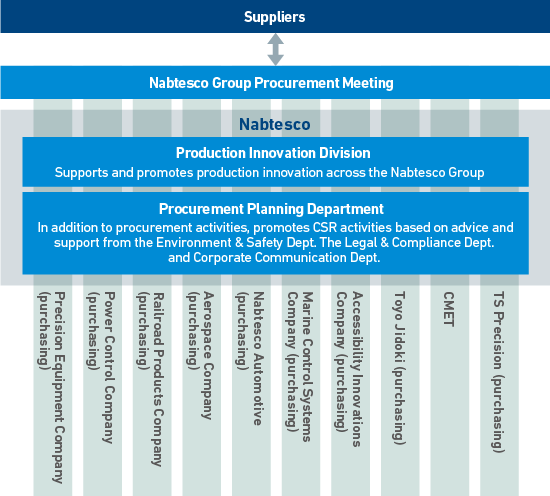 We at the Nabtesco Group have been taking measures for manufacturing innovation by pursuing collaboration with suppliers with the aim of strengthening our comprehensive procurement capabilities from the perspectives of sustainability, including quality, cost and delivery (QCD) and technological development. In order to achieve medium- to long-term growth for the Group, it is essential to secure a sustainable supply chain. We are promoting CSR-oriented procurement by recognizing fair, proper and transparent procurement activities as one of our material CSR issues (materiality). In order to promote CSR-oriented procurement, we need to have expertise and know-how on environment- and human rights-related issues, which are not conventionally handled by procurement departments. Therefore, the Procurement Planning Department of the Production Innovation Division, in collaboration with the head office departments, plays a central role in promoting CSR-oriented procurement, including supporting the activities conducted to this end by the in-house companies and Group companies. The Procurement Planning Department discusses and decides on the related policies and measures at the Group Procurement Meeting held with the participation of the procurement departments of each in-house and Group company, providing education and training for procurement managers. Through these Group-wide efforts, we endeavor to fulfill our social responsibility throughout the supply chain in cooperation with our suppliers. In accordance with the globalization of our business, we increasingly need to respond appropriately in our supply chain to the worldwide demands related to the environment and human rights. On April 1, 2014, aiming to further foster CSR activities across the supply chain, we established the Nabtesco Group CSR-Oriented Procurement Policy. 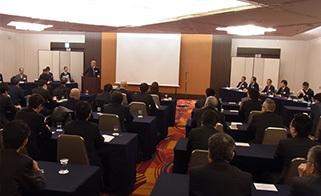 In formulating this policy, we referred to the ISO 26000 standard, the United Nations Guiding Principles on Business and Human Rights, the Electronic Industry Citizenship Coalition (EICC) Code of Conduct, and other international guidelines, and also incorporated into the policy the ideas expressed in the Nabtesco Group Code of Ethics. We provide practical training to procurement managers of in-house companies and Group companies to deepen their understanding of the Nabtesco Group CSR-Oriented Procurement Policy and how to ask for cooperation from suppliers with regard to the survey research and interview visits. Upon completion of the training, the procurement managers, equipped with a full understanding of CSR-oriented procurement, work to ensure that the Policy is thoroughly implemented by gaining support from the suppliers. Regarding Nabtesco Group's CSR-Oriented Procurement Policy, since the latter half of FY2014 we have visited local sites in China, Thailand, and South Korea and provided briefings to the relevant employees of our suppliers to accelerate the penetration of our global policy. Since then, we have held the briefings for approximately 600 suppliers annually. Based on the policy, the entire group will work as one to promote and implement CSR-oriented procurement activities to fulfill the expectations of customers and other stakeholders, while facilitating the understanding of new suppliers and strengthening our partnership with existing suppliers. The Nabtesco group identifies the important suppliers for our business sustainability based on their trade volume, QCD (Quality, Cost, and Delivery compliance) performance, technical development capability, financial health, and other factors. 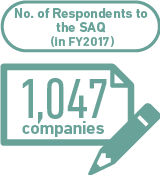 To enhance our CSR-oriented procurement, we have implemented SAQ for the primary suppliers, including key suppliers in and outside Japan every year since FY2014. In FY2017, we expanded its scope to China and implemented SAQ, which is based on our CSR-oriented Procurement Policy using the questionnaire method, to 1,047 suppliers (all primary suppliers including 919 suppliers in Japan and 128 suppliers in China). The questions in the questionnaire comprise six large categories and 41 middle categories based on the items in the CSR-oriented Procurement Policy. We performed an evaluation according to the weight of each middle category item. Our goal was to obtain 80 points or more out of 100 points in each large category item by FY2017. As a result, we achieved the goal of 80 points or more in two out of the six items. We analyzed and evaluated the questionnaire results for each supplier and fed them back in a written document. 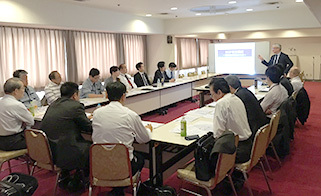 In addition, we have visited certain suppliers directly to hear from them in order to prepare the ideas of initiatives aiming to facilitate the CSR activities in cooperation with them, such as the extraction of improvement items and risks in the environment, safety, and health and planning of improvement measures. We will continue to refine the SAQ by, for example, considering the addition of questions regarding CO2 reduction. In the Basic Purchase Agreement that we conclude with new suppliers, we list not only compliance, including the prevention of any form of corruption such as bid rigging or bribery, but also consideration to the environment and occupational health and safety and the elimination of anti-social forces as the most important items to be observed by our suppliers. We had zero cases of non-compliance with our CSR procurement policy in FY2017. Nabtesco signed the United Nations Global Compact in April 2014 to show that it supports this international initiative, and has since been proactively participating in the activities conducted by the Global Compact Network Japan. We have worked to set norms and criteria and to solve problems for global CSR-oriented procurement in cooperation with peers and companies in other industries in the study group on supply chains. In FY2017, Nabtesco was appointed a corporate leader for the supply chain study group again and contributed to the completion of an SAQ (self-assessment tool for CSR-oriented procurement) that can be used across the industry. We will continue to work on the enhancement of the SAQ while promoting its use in collaboration with external initiatives in the future. As neither Nabtesco Corporation nor its Group companies are listed on US stock markets, we are not subject to the Dodd-Frank Act or the reporting obligation with regard to the use of conflict minerals. The Nabtesco Group, however, is focused on strategic measures for conflict minerals from the perspective of risk management through establishing a sustainable supply chain system while keeping an eye on maintaining international peace and security. To this end, we will conduct the Reasonable Country of Origin Inquiry (RCOI) in cooperation with our suppliers in response to requests from customers to conduct surveys on conflict minerals. We aim to establish a responsible procurement system to avoid becoming complicit in the activities of armed groups and conflicts by working closely with our suppliers and Group companies. * The term “conflict minerals”refers to four mined minerals (gold, tantalum, tin and tungsten), which may be partially used to fund armed groups and exacerbate conflicts in the Democratic Republic of the Congo and surrounding countries. In the United States, pursuant to the Dodd-Frank Wall Street Reform and Consumer Protection Act established in 2010, companies using these minerals are required to report such use to the Securities and Exchange Commission. 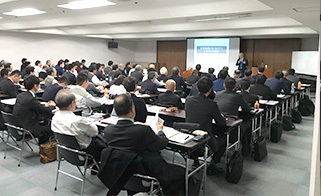 Learning from the Great East Japan Earthquake in 2011 and the Kumamoto earthquakes in 2016, the Nabtesco Group started initiatives for reducing procurement risks, which will mainly be conducted by the Procurement Planning Department at the headquarters and the procurement division at each business base, with disaster-affected suppliers in the event of a wide-scale disaster considered an important business sustainability risk. As one of those initiatives, we have decided to expand the scope of our BCP activities from our group to our suppliers (supply chain). As a result of the investigations on the BCP development situation of main suppliers of the Nabtesco Group, approximately 100 out of 400 suppliers have already developed it, while approximately 300 have not. Therefore, in our three-year plan we have set a goal to complete its development at all 300 companies. 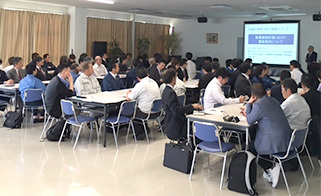 As one of our concrete activities, we have cooperated with local municipalities where many suppliers are located (Gifu and Osaka pref., Kobe and Iwakuni city in Japan) and asked many suppliers to participate in the "BCP Enlightenment Seminar" held by each local municipalities. We position this seminar as an introductory course for understanding the BCP. 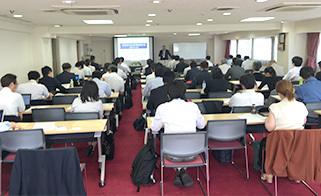 For the suppliers that participated in the introductory seminar, we provide the "BCP Development Course" (Held monthly at Kobe and Iwakuni city) which we consider as an advanced BCP course for developing the BCP. 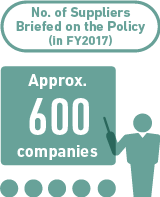 Through those activities, we not only support suppliers with BCP development, but also recommend that they obtain the Japan’s Cabinet Secretariat’s certification for companies contributing to national resilience (Resilience Certification）, aiming to develop a viable BCP.